Throughout the span of Greg Hildebrandt's 56 year career he has painted thousands of pieces of art across numerous genres, including one of his favorite classics: Alice in Wonderland. It is because of this belief that Greg has chosen to offer this beautiful limited, numbered series of Alice in Wonderland 150th Anniversary prints. 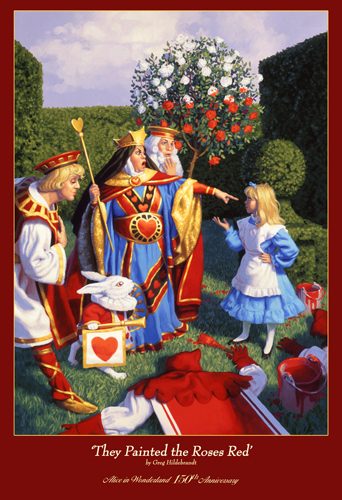 In celebration of the 150th Anniversary of the publication of Alice in Wonderland we are releasing this new, limited edition set of six unique prints, each capturing some of the best moments in Wonderland -- all painted by Greg Hildebrandt. These beautiful paintings for this sensational classic have NEVER been released as individual prints before, and have not been in print since they were published in 1990. Spiderwebart Gallery is proud to release the only prints in existence! There are 150 pieces in each edition. Each print will be hand-signed and hand-numbered by the artist, Greg Hildebrandt. Prints may be purchased individually or you can get the whole set of 6! Remember, each of these editions will only have 150 prints available, so if you are a Hildebrandt or Alice in Wonderland fan, order yours today! Every print is on gorgeous 13" x 19" luster paper, which allows for deeper, richer colors. Every painting is vibrant, and full of life, which is exactly how we like them to look in our reproductions! Greg Hildebrandt will be hand-signing and numbering each of these prints per order. If you'd like to order the entire set, click here!